Tonight I will be posting two of my last Santa figures for the Christmas season. These Santa figures are definitely very unique and very special! Hope you enjoy them! Stop back often to see my latest creations FROM A SIMPLER TIME! Tonight I will be listing my second group of Santa figures for the 2017 Christmas holiday. You can click on the link under each picture to purchase the item for sale on ebay. Please check back often! I will be listing new Santa figures each week until Christmas! A gorgeous Christmas stocking wreath. Perfect to welcome your guests at the holiday season! An awesome Christmas piece! Santa is riding an antique bear to deliver his Christmas packages! This Santa is adorable! 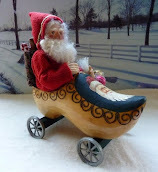 Santa is placed in an antique paper mache boot! He has a sweet little teddy bear in front to deliver to a special girl or boy! 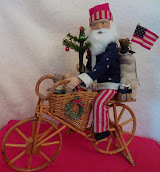 This Santa was created to show off his patriotic colors! Santa is mounted an an antique beehive bobbin! Thanks for stopping by and keep checking in to see my latest creations!